Expert mountaineering guides and equipment make this tour ideal for first-time glacier hikers. 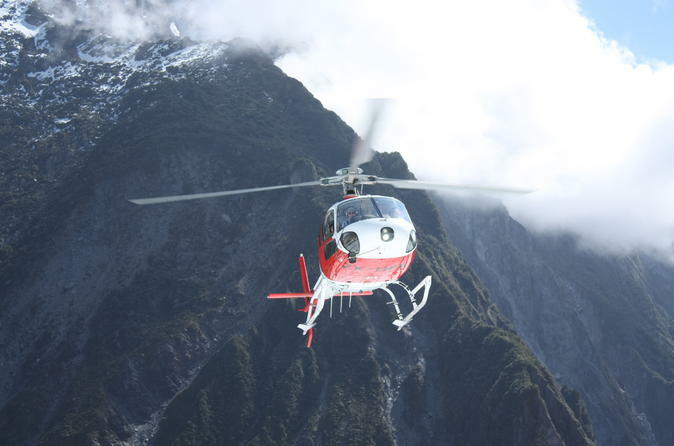 Start your Franz Josef Glacier tour at a helicopter base in town. Receive a safety briefing and be fitted with provided gear including a waterproof jacket, glacier boots with socks and ice crampons, and an ice axe. Then board the AS355 twin-engine Squirrel, a helicopter whose open-plan cabin offers prime views for all six passengers. Hover above remote landscapes with access to the 7.5-mile-long (12-km) Franz Josef Glacier. Fly right by towering peaks, over deep crevasses, and past pristine blue waterways. Admire the sparkling ice before an exciting landing high up on the glacier between two icefalls. Then hop out to begin your guided hike over the picturesque icy terrain, most often seen only by skilled mountaineers. 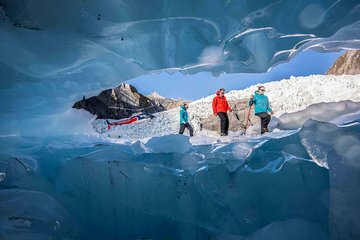 Clamber in and around ice caves as your guide points out dramatic pinnacles and seracs, and learn about the history and current conditions of Franz Josef Glacier. Enjoy plenty of photo ops before you reboard the helicopter for the ride back to town. Booked a trip and received very detailed information upfront which was great! We drove 5 hrs to Franz Josef and we were really excited. The check in process was great and very efficient. The helicopter ride was short but we got to see the glacier and was long enough for us. The guide we received was not great. She spoke a lot about her personal life, which none of us us were very interested in speaking to so our group was quite quiet. It seemed like we were there to entertain her and she was bored. We ended up ending our hike at 2:20; 40 minute earlier than our tour end time. We were supposed to stop at another stop but the other guide didn't respond to her request to go there since her guide level restricted as to where she could go. As a result, we just walked back and stood on the ice for 10 minutes listening to how she talked about how there were issues between helicopter line and her company. The helicopter ride back would've been max 10 min so we were extremely disappointed to have our hike cut short and had to listen to the company issues instead of hiking. At the very end, another guide came with is group and mentioned they had a great tour. She told him "my group didn't talk but whatever" with a very annoyed tone right in front of us. Our ride back was fine and I asked to speak to the manager but he/she wasn't there that day. It has been 3 days since and I haven't heard a response yet. Overall, this may be a one off experience but maybe try booking with an alternative company as if you are spending $300+ per person, you want to ensure that you get a great experience. We were extremely disappointed..we flew 17 + hrs and drove 5 + hrs to get here. Hope others experience will be different in the future. The attitude of the staff working here - specially the manager- will ruin your experience and vacation. Take your money somewhere else. No lo pude hacer por clima, no paro de llover. BRILLIANT , MUST DO TOUR . This is a great activity. It was amazing to fly up to the glacier and walk around it. Our guide was knowledgeable. Only negative was we hiked in a small loop from where the helicopter drops you off. I would have been nice to hike a longer distance, but I understand the guides have to consider the capabilities of the weakest member of the group. A must do, was a great experience staff and guide on the Glacier were excellent. It could have been 4.5 stars. Our guide Eric was very diligent and helpful. Explained quite a bit on the geo knowledge. The heli ride was exiting except it was quite short. To be honest, there was not much to see over there but the experience was unforgettable. This was a great experience! I suggest breaking the groups on the glacier into different fitness levels. We spent too much time waiting for others in the group. I feel like we missed out on some great views because of this. A great event well worth doing.